In an interview a few weeks ago, James Mercer said he’d been having more fun than ever touring in support of “Heartworms,” the fifth studio album by the Shins. On stage at the Knitting Factory on Sunday night, Mercer and the latest incarnation of the Shins proved his assertion absolutely correct. From their opening number “Caring is Creepy” to the finale, “Sleeping Lessons,” and 16 songs in between, their fun was infectious. Which was kind of surprising. I expected a grump – a bearded, Morrissey-esque guy who cloaks depressing lyrics in cheerful pop rock. For years the knock on Mercer as a lead singer was that he tended to be standoffish, and he willingly let larger personalities in the band play to the crowd. But now that he is the Shins, having disbanded the original lineup after “Wincing the Night Away,” that pressure to be center stage falls on his shoulders. Thankfully, he’s up to the task. He raised his red Solo cup to the crowd as he took the stage. His face frequently sported a smile. He and his bandmates cheerfully talked about the meals they had (at Frank’s Diner and Steelhead) while in town. The band bantered about their connections to Spokane, no matter how tenuous. Most importantly, they breathed energy into Mercer’s songs, reminding us why the Shins were one of the best bands to emerge in the 2000s. Mercer, aided by Jon Sortland (drums), Mark Watrous (guitar), Casey Foubert (guitar), Yuuki Matthews (bass), and Patti King (keyboards), breathed confident life into the Shins catalog. The new stuff – Sunday’s set list featured seven songs from “Heartworms” – sounded just as good as old favorites like “New Slang” and “Australia” and “Saint Simon.” “Painting a Hole,” with its urgent staccato rhythms, simply rocked. “Cherry Hearts,” which Mercer said they were performing live for the first time, was lovely. 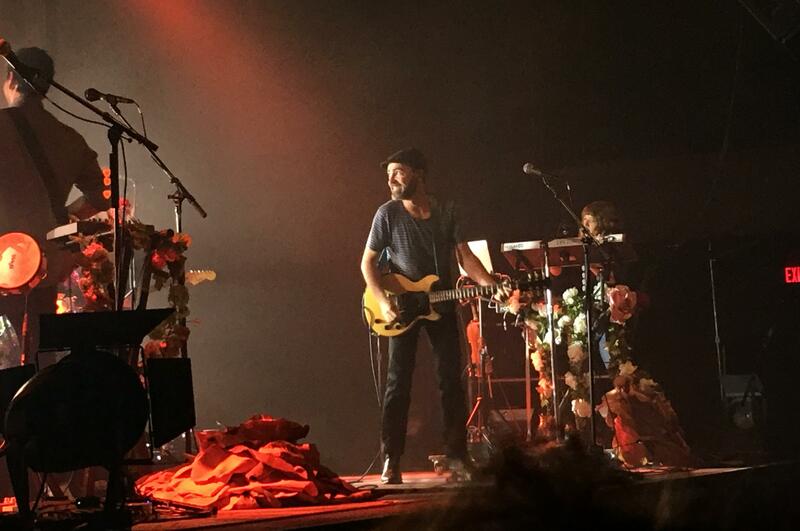 “Name for You” is a perfect Shins song – charming and catchy and fun to hear live. For “The Fear,” Watrous, King and Foubert broke out their violins, bringing a mariachi vibe to this down-tempo track. Of course the fans wanted to hear their favorites, and they weren’t disappointed. “Saint Simon” had them singing along with the la la la las. “Australia” got them bouncing. “Sleeping Lessons,” with its segue into Tom Petty’s “American Girl,” was a blast. Then there’s the song that was going to change our lives (at least that’s what Natalie Portman promised Zach Braff in the 2004 film “Garden State”). So yes, James Mercer is having a good time. And Spokane fans are quite grateful. Published: Sept. 25, 2017, 3:06 p.m. Updated: Sept. 25, 2017, 11:09 p.m.